Hello everyone! There are only 6 days left until we confirm all the stalls for the next Central Bazaar on the 11th Sept!! Its all very exciting! Central Bazaar on Wrexham.gov.uk What's On Guide Online. We are very happy to announce the next Central Bazaar is taking place on Saturday 11th Sept 2010 at Yales Cafe Bar/Central Station, Hill Street, Wrexham. If you don't know already, Central Bazaar is a modern take on the traditional craft fair, incorporating a wide variety of styles presented in a huge variety of handicrafts including vintage inspired home-crafts, music offerings and mixed media artworks, as well as Wrexham's only opportunity to browse, try and buy vintage clothing and accessories. 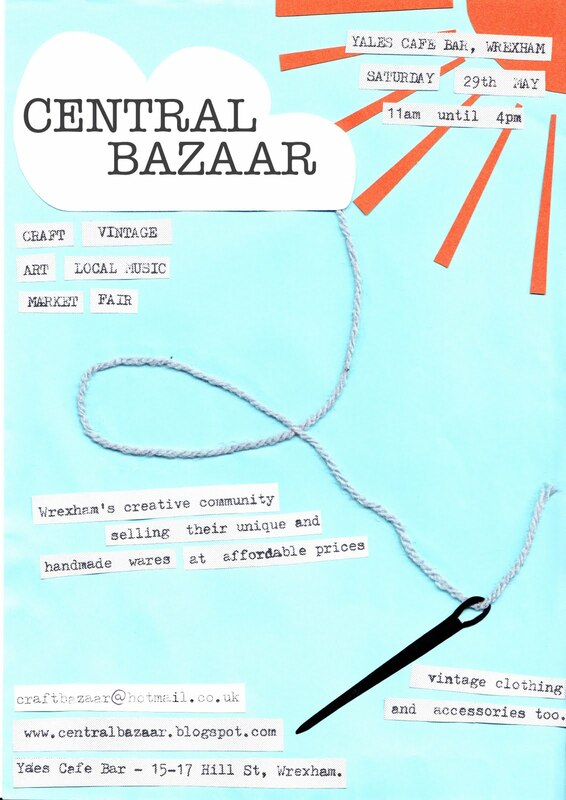 Central Bazaar has been created to offer Wrexham’s creative community the opportunity to help promote and inspire each other. Central Bazaar is an exciting shopping opportunity for the people of Wrexham and beyond to get hold of something really interesting and unique. All the items on sale have been produced by the people behind the stall in their homes or studios, so if you want something different as a gift or a treat make sure you get there in September. If you are an artist, crafter, photographer, knitter or want to showcase any other creative talents and would like a stall then please get in touch. We will be accepting applications for stalls until the 14th August then after that date we will confirm who we can offer stalls to at this event. The reason we use this simple application process is because we want to offer as much variety as possible to our events. Rather than just accepting stalls on a first come first serve basis as most other event organisers do we give everyone and equal chance to get a stall then let everyone know who has been successful. 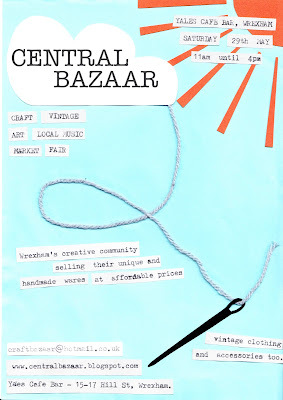 Please email craftbazaar@hotmail.co.uk if you would like an application form for the next Central Bazzar on 11th Sept. If you could invite your friends to the event too that would be great! All the applications are in now and everything we've seen has been so beautifully made, so Emma and I are struggling to pick the stall holders. With limited space of 20 tables it looks like we're going to have to expand again next time. This just keeps getting bigger and bigger. We are really pleased to be able to offer some of the people we turned away for the last fair a space at the upcoming date on May 29th. We're also super excited to have Doodlezine coming along with a stall. Keep an eye out for updates on stall holders as we confirm them. Also, here is our lovely new handmade poster, the design is courtesy of Mike at the music stall with a few additions from myself. It still needs a bit of a tweak but i love the design. Thanks to everyone who's applied.